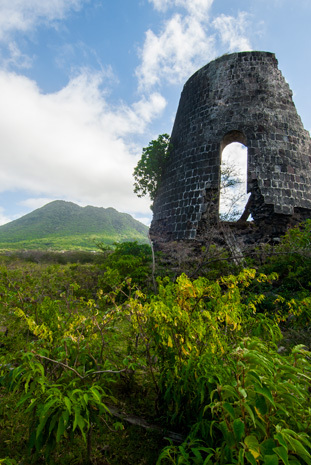 St. Eustatius is the ‘historic gem’ of the Caribbean. After Christopher Columbus sited the island in 1493, the island changed hands at least 22 times among the British, French and Dutch. In 1636, after the 80-year war between the Dutch and Spanish, the Dutch took possession and made St. Eustatius a duty free island in 1756. This free port status, its naturally deep harbour and the perfect geographic location between Europe and America, made St. Eustatius one of the busiest ports in the world. Over 3000 merchant ships visited St. Eustatius between 1775 and 1800. The tiny island supported over 20,000 people and earned its title, ‘The Golden Rock’. 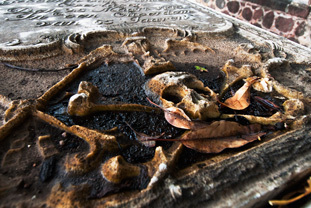 When you walk around St. Eustatius, you find evidence of the rich past everywhere. The ruins of the oceanfront warehouses are all over Lower town, you find pieces of pottery and clay pipes on the beach and there are loads of historical places of interest to visit. The origin of the blue beads goes back to the 17th century when the Dutch West India Company used these beads for trading. The pentagonal shaped beads were made in Amsterdam and travelled the world wherever the Dutch went. Thirty blue beads were used by the Dutch to purchase New York’s Manhattan island from the native Indians. The beads in St. Eustatius were given to slaves as wages. After emancipation, the legend says the ex slaves gathered at the cliffs and threw their beads in the sea to celebrate freedom. This is probably the reason that most of the blue beads are found by divers in the dive site called blue bead hole. The best technique to find them is somewhere between swimming close to the sandy bottom and a few meters above the bottom for a wide angle view. The moment you spot something blue, you feel your heart pounding, but don’t get too excited as you may end up with a small shard and they don’t count. You never forget the moment you find your first blue bead and the atmosphere on the boat when the trophy is examined by fellow divers. • Stroll around the Upper Town and Lower Town and learn more about the history of St Eustatius on a 1½ hour guided walking tour. • The Historical Foundation Museum presents the island's history and the Caribbean in general.